By studying in great detail the 'ringing' of a planet-harbouring star, a team of astronomers using ESO's 3.6-m telescope have shown that it must have drifted away from the metal-rich Hyades cluster. This discovery has implications for theories of star and planet formation, and for the dynamics of our Milky Way. 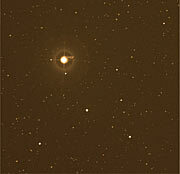 The yellow-orange star Iota Horologii, located 56 light-years away towards the southern Horologium ("The Clock") constellation, belongs to the so-called "Hyades stream", a large number of stars that move in the same direction. Previously, astronomers using an ESO telescope had shown that the star harbours a planet, more than 2 times as large as Jupiter and orbiting in 320 days. But until now, all studies were unable to pinpoint the exact characteristics of the star, and hence to understand its origin. A team of astronomers, led by Sylvie Vauclair from the University of Toulouse, France, therefore decided to use the technique of 'asteroseismology' to unlock the star's secrets. "In the same way as geologists monitor how seismic waves generated by earthquakes propagate through the Earth and learn about the inner structure of our planet, it is possible to study sound waves running through a star, which forms a sort of large, spherical bell," says Vauclair. The 'ringing' from this giant musical instrument provides astronomers with plenty of information about the physical conditions in the star's interior. And to 'listen to the music', the astronomers used one of the best instruments available. The observations were conducted in November 2006 during 8 consecutive nights with the state-of-the-art HARPS spectrograph mounted on the ESO 3.6-m telescope at La Silla. Up to 25 'notes' could be identified in the unique dataset, most of them corresponding to waves having a period of about 6.5 minutes. These observations allowed the astronomers to obtain a very precise portrait of Iota Horologii: its temperature is 6150 K, its mass is 1.25 times that of the Sun, and its age is 625 million years. Moreover, the star is found to be more metal-rich than the Sun by about 50%. "These results show the power of asteroseismology when using a very precise instrument such as HARPS," says Vauclair. "It also shows that Iota Horologii has the same metal abundance and age as the Hyades cluster and this cannot be a coincidence." 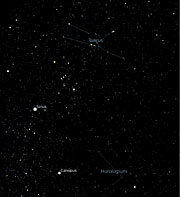 The Hyades is an ensemble of stars that is seen with the unaided eye in the Northern constellation Taurus ("The Bull"). This open cluster, located 151 light-years away, contains stars that were formed together 625 million years ago. 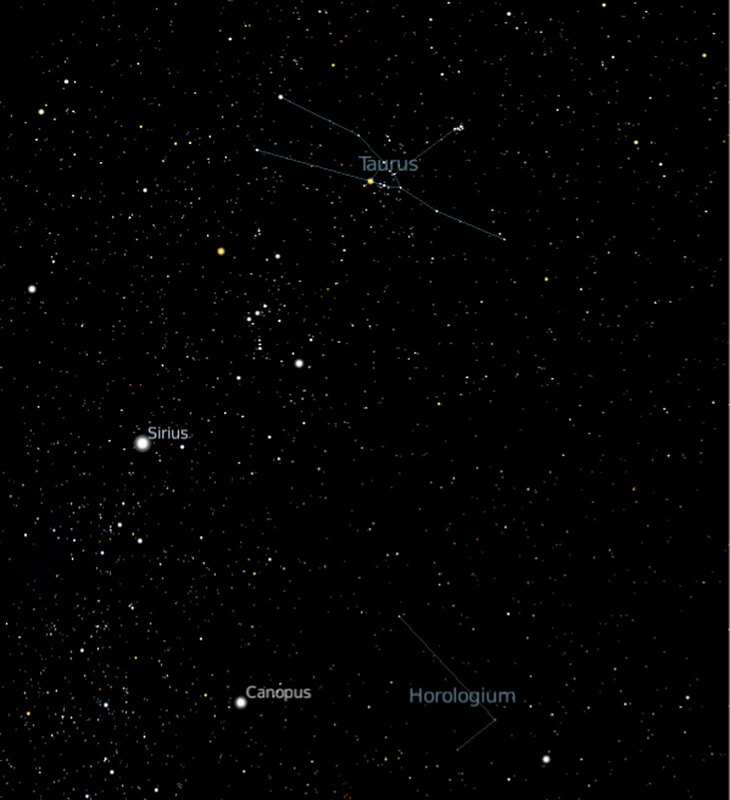 The star Iota Horologii must have thus formed together with the stars of the Hyades cluster but must have slowly drifted away, being presently more than 130 light-years away from its original birthplace. This is an important result to understand how stars move on the galactic highways of the Milky Way. This also means that the amount of metals present in the star is due to the original cloud from which it formed and not because it engulfed planetary material. "The chicken and egg question of whether the star got planets because it is metal-rich, or whether it is metal-rich because it made planets that were swallowed up is at least answered in one case," says Vauclair. 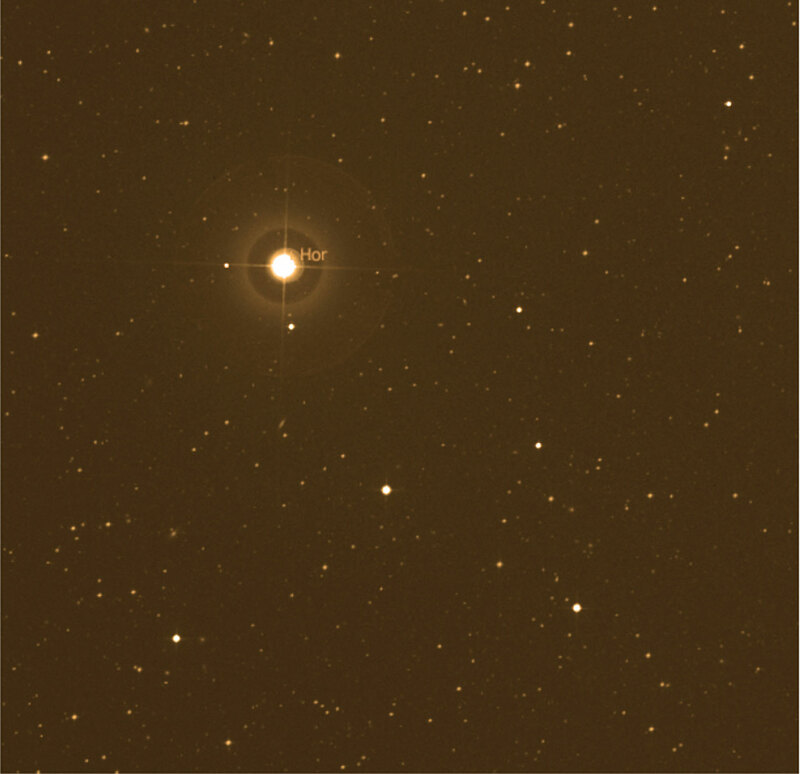 The astronomers' study is being published as a Letter to the Editor in Astronomy and Astrophysics ("The exoplanet-host star iota Horologii: an evaporated member of the primordial Hyades cluster", by S. Vauclair et al.). The team is composed of Sylvie Vauclair, Marion Laymand, Gérard Vauclair, Alain Hui Bon Hoa, and Stéphane Charpinet (LATT, Toulouse, France), François Bouchy (IAP, Paris, France), and Michaël Bazot (University of Porto, Portugal).